By RICHARD WOLF, Guest Columnist, THE BUGLE Winter 2011 Cover Story (a Quarterly Publication of the WVM). Fritz E. Wolf was born in Shawano, Wisconsin on February 8, 1916. He attended Shawano High School where he excelled in leadership, character and athletics, graduating in 1933. His athletic prowess on the gridiron and basketball court earned him a basketball scholarship from Carroll College in Waukesha, Wisconsin. He never played a basketball game for the school. Instead he turned to football, becoming an all-conference fullback for three straight years. During that time Carroll only lost one game. In 1938 Fritz graduated from Carroll College with a degree in Business Administration. He had the opportunity to try out with the Green Bay Packers but missed the tryout do to an appendicitis attack. About this time Fritz realized that if he was ever going to satisfy his dream to learn to fly, now was the time. In 1939, he enlisted in the United States Navy. 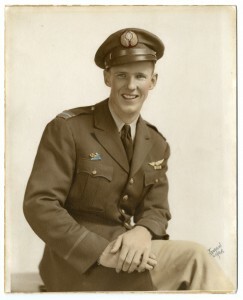 Upon completion of flight training in 1940, he received a commission as an Ensign and assignment as a dive-bomber pilot aboard the USS Saratoga. In the summer of 1941, Fritz resigned his commission to join the American Volunteer Group (AVG) Flying Tigers. Like a lot of other pilots, he was looking for a little more excitement. 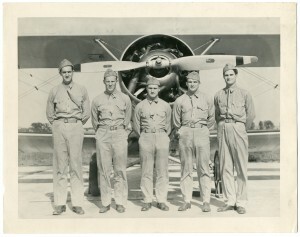 My father sailed in the first contingent of AVG pilots from San Francisco on July 6, 1941 aboard the Jaegersfontein. His passport read agriculture student. The AVG arrived at Toungoo, Burma sometime in September of that year. The first month after his arrival was spent getting the P-40 aircraft ready for combat. The rest of the time was spent learning to fight the Japanese. This was accomplished through one-hour lectures given by Chennault and a lot of simulated dogfights. On December 20, 1941, he took part in the first AVG action near Kunming, China. During that battle, he shot down two Mitsubishi bombers and assisted in downing a third before his ammunition ran out. During the month of February in 1942, somewhere near Rangoon, Burma, Fritz took part in a dog fight with 14 Japanese fighters. During his tour with the AVG, Fritz was subject to unhealthy conditions and illness. Anticipating his death, a coffin was built for him. Because of his illnesses he spent significant time on the ground. During that time he assumed operational duties. Like everything else he did, Wolf performed admirably. Chennault praised him for his administrative skills. Fritz Wolf was honorably discharged on July 4, 1942. By that time he had logged 220 hours of combat flying in the skies over Burma and China fighting the Japanese. The Chinese Government awarded him the White Cloud Banner 6th Grade for heroism, China Air Force Wings 2 and 4 star, and China War Memorial Decoration. 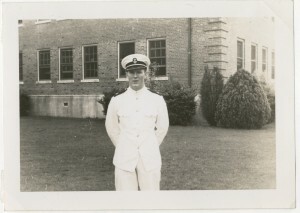 After coming back to the United States to recover (he had lost 40 pounds in China), Fritz returned to the Navy with the rank of Lieutenant, senior grade. He was assigned as a fighter pilot instructor at Jacksonville Naval Air Station in Florida. He was later transferred to Green Cove Springs, Florida to train with other replacement pilots that were preparing to be shipped over seas. Fritz was the team’s section leader. Fritz and his team were eventually assigned to the USS Hornet on January 8, 1945. Flying Grumman F6F Hellcats during his time in VF-11 (the Sun Downers), Fritz and the rest of the squadron struck Japanese targets in Hong Kong, Formosa, Hainan Island and French Indo-China. On one mission over Formosa, his plane lost fuel pressure and he was forced to make a sea landing. After three hours floating around in the ocean he was finally picked up by a destroyer. He later said that being plucked out of the water was worse than drowning. When the Hornet reached Ulithi after conclusion of its South China Sea action in early February of 1945, Fritz was made CO of the newly formed VBF-3 squadron aboard the USS Yorktown. His squadron would participate in strikes supporting the invasion of Iwo Jima. He also led the first historic naval carrier-based bombing attack against targets on mainland Japan. During this mission he officially shot down his fifth plane making him an ace. He was also awarded the Distinguished Flying Cross for his heroic action. He was later transferred to Naval Auxiliary Air Station, Brown Field, Chula Vista, California, where he served as Executive Officer. During this time he made application to the regular Navy, but was turned down for health reasons. His life in aviation was not over, however. He stayed in the Naval Reserve, retiring in 1967 as a Commander. For his service to his country during World War II Fritz E. Wolf received the following awards and decorations: Two Distinguish Flying Crosses, Air Medal, Presidential Unit Citation Award, WWII Victory Medal, Three Stars Asiatic Pacific Campaign Medal, One Star Philippine Liberation Medal, American Defense Service Medal and American Campaign Medal. Pilot Fritz E. Wolf in uniform of Claire Chennault’s famed American Volunteer Group – The Flying Tigers.